A search for “meditation timer” on my iPhone gives 111 results – many of them free, others at a usually quite low price. (Similar results appear on Android devices.) 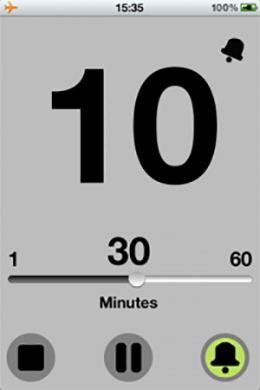 I have presented Insight timer on this blog before, and that is still the one I use. It is not free, however, and although the price is not high, some might prefer to find a costless alternative. Many timers come in two variants, one free (but with ads and a more limited set of features), another at a price. Meditation timers may have many functions and features. 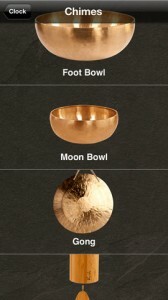 When timing your meditation, you can usually choose to include one or more sounds (cymbals, gongs, bowls etc.) at the beginning and/or end of your meditation, and/or at certain intervals during your meditation. Some timers (“Sati” for instance) have preset times only, others let you choose the length of your meditation, and most even let you create your own fixed presets. In addition to measuring the time, meditation timers often provide statistics for your meditation habits as well as a log and/or journal function, where you can make notes related to each session. Some also include web-based features allowing other users to see when you meditate and how long (plus a personal message from you to the world), and to link up to other users on Facebook. Other meditation timers, like “Samsara”, “Minimalist Timer”, “i-Qi” and “Mind”, make a point of being simple – they avoid all the extras and simply help you to time your meditation. The only real problem I have with Insight timer is during advanced deepening retreats in Acem Meditation, when meditation times are sometimes as long as 28 or even 50 hours (during which the meditator may sleep or lie down when needed, eat, drink and go to the toilet, and do yoga etc. – but all in one session). The Insight timer stops at 23 hours 59 minutes, and so do many similar apps – they actually seem to use the same clock. Others stop at shorter time spans, such as “MyMeditation” (30 minutes) and “ClockFlow”, “UJITimer” and “Samsara” (1 hour). This sometimes reflects the fact that they build on meditation practices that aren’t suitable for longer continuous sessions. At other times, it simply reflects the fact that they prefer shorter meditations, as with “TMCircle” (which is preset to 21 minutes but can be adjusted to 48). I was able to set the time on “MedLogFree” to 596523 hours, but the timer seemed weird, and I haven’t tried it out, and don’t know if it would work. And to be honest, I think that would be a little too long. “TimeFrames” stopped at 99 minutes 59 seconds. I was able to set “Timer Flo” to 50 hours. Some meditation timers only allow you to measure time in minutes or even seconds, which make them useless for long meditations. One problem with many timers is that they don’t work when you turn the phone to silent mode (which you would naturally like to do when you meditate, to avoid being disturbed by telephone calls) or sleep mode (which avoids tapping the battery unnecessarily, and which avoids lightening up the room with your iPhone screen). This was a problem with “MedLogFree” (which had a rather ugly sound anyway), “Mind”, “Timer Flo”, “VisTimerFree”, “Samsara” and undoubtedly many others. Different people like different sounds. The typical meditation timer sounds all sound Buddhist to me – gongs or bowls or cymbals or other ritual instruments producing a very long sound – it takes forever before it comes to a complete halt. “Sati” includes a drum sound, “Minimalist timer” lets you choose between many not particularly “spiritual” sounds (of which I liked the beep best), “Timer Flo” has two rather ugly alarm sounds, and my version of “Insight timer” has a “WoodBlock” sound which works fine and is over in less than a second. Of course, I haven’t tried out all 111 alternatives, especially not the ones that cost money. But based on what I’ve seen, if I were to switch to a free meditation timer with only the simplest features, I would probably choose i-Qi. It lets you choose between a number of sounds (though all of them long-winded bowl, cymbal or gong-like sounds), works fine in silent mode and sleep mode, and lets you meditate for up to 23 hours and 59 minutes, which certainly is enough for most occasions. It does not have log or journal features, nor does it let your “friends” see when you meditate. And it only sounds at the end of meditation time, not at the beginning or at intervals – all of which is fine with me, though perhaps not with everybody. Meditation is really helpful for a stressed mind. It relaxes it well and helps a person to overcome mental trauma. I like Insight Timer best. I love being able to track my history and it enables me to see the correlations between the events in my life and my level of commitment to myself through meditation. I also find mindfulness is crucial to bringing the peace from meditation into the rest of my day. I made a video about how I use mindfulness to bring a sense of clarity and well-being into my days and dive deeper into the present moment to enjoy life more fully, freer from suffering. I appreciate the information so accurate on meditation timers … before I did not know they existed. So far, I’ve been using the default timer on iPhone. 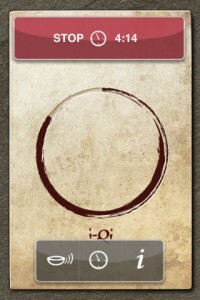 Now and out of curiosity I have downloaded the insight timer with the idea of keeping track of my meditations. By the way, I love the woodblock sound as the beginning and ending bell. Cheers! I have tried multiple timers, but my favorite is, like you, Insight Timer. It’s probably not very ‘yoga” of me, but I love reaching the milestones and the automatic twitter sharing. Does anyone know of an Android meditation timer that has an option for the screen to light up, rather than a sound at the end of a meditation? I used to have a timer on my Palm Centro called Pocket Doan that had an option of SILENCE at the end of meditation; instead the screen would light up, and not too brightly. I liked this option because I meditate with my eyes open (Zen style), and if I am meditating with others the bell can be disturbing to them, but only I see the light on my phone. PS I have tried Insight Timer but it has too many bells and whistles and ways to “connect” to others Facebook style. I find this distracting from my purpose in meditating. So far I have enjoyed “Meditation Support Timer.” Very simple and not distracting. It does what I want: it’s JUST A TIMER! It does have options to sound a bell at intervals during meditation, in case you want to be reminded you’re supposed to be meditating. “Zazen Meditation” is similar.